Monday May 22nd: Regular school day. 1st, 3rd, and 8th bell exams. School ends at the regular time (2:50 PM). 2nd and 4th bell exams. High school students will be dismissed at 11:35 AM. However, for those who cannot find a ride home our bus service will be taking students home at the regular time (2:50). We are providing lunch for those who stay. Junior High Students are on a regular school day and will be dismissed at 2:50 PM. 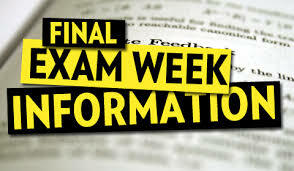 Thursday May 25th: Third day of exams and final day for all Monroe students. 5th/6th and 7th bell exams. High school students and junior high students will be dismissed at 11:35 AM. However, we are providing lunch between 11:38 - 12:10. Buses will be leaving school at 12:15. This is a district wide early leave day. Buses leave the high school / junior high school at 12:15. Elementary departs at 1:15. Primary departs at 1:20. * Regular start times for each building this week.